SSTAR is an acronym for the “small, sealed, transportable, autonomous reactor” – being primarily researched and developed in the USA by Lawrence Livermore National Laboratory. It is designed as a fast breeder nuclear reactor that is passively safe. It has a self-contained fuel source of Uranium-235 containing also Uranium-238 which will be partly consumed by fast-neutron fission and, more important, converted into more fissile material (“breeding” Plutonium). It should have an operative life of 30 years, providing a constant power source between 10 and 100 megawatts. The 100 megawatt version is expected to be 15 meters high by 3 meters wide, and weigh 500 tonnes. A 10 megawatt version is expected to weigh less than 200 tonnes. 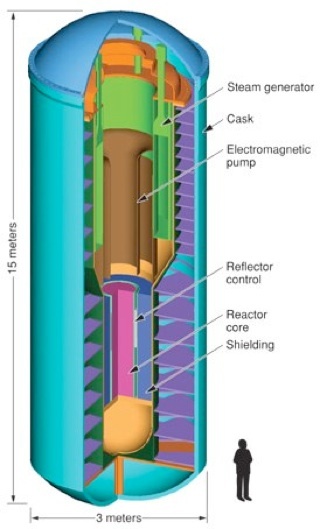 To obtain the desired 30 year life span, the design calls for a movable neutron reflector to be placed over a column of fuel. The reflector’s slow downward travel over the column would cause the fuel to be burned from the top of the column to the bottom. Because the unit will be sealed, it is expected that a breeder reaction will be used to further extend the life of the fuel. SSTAR is meant to be tamper resistant, which would prevent the leasing country from opening the reactor to use the generated plutonium for nuclear weapons. The tamper-resistant features will include radio monitoring and remote deactivation. The leasing country will therefore have to accept the capability for remote foreign intervention in the facility. The feature might, however, interfere with possible recovery work during an accident. Currently, no prototypes for SSTAR exist – one is expected by 2015, and they are being researched as a possible replacement for today’s light water reactors. and as a possible design for use in developing countries (which would use the reactor for several decades and then return the entire unit to the manufacturing country).